JUNE SIMMS: September seventeenth will mark the one year anniversary of the American protest known as Occupy Wall Street. The leaderless movement spread around the world, but has yet to realize its main goals. Shirley Griffith has more. SHIRLEY GRIFFITH: Zuccotti Park in New York City is where it all started. The park is close to the New York Stock Exchange and financial offices. Many of them are on Wall Street, the name often used for America’s banking and financial industry. A year ago, activists called for a protest to take place in Zuccotti Park on September seventeenth. They set no end date. Protesters brought temporary shelters, food, extra clothes and other things necessary for an occupation. And they stayed for several weeks. 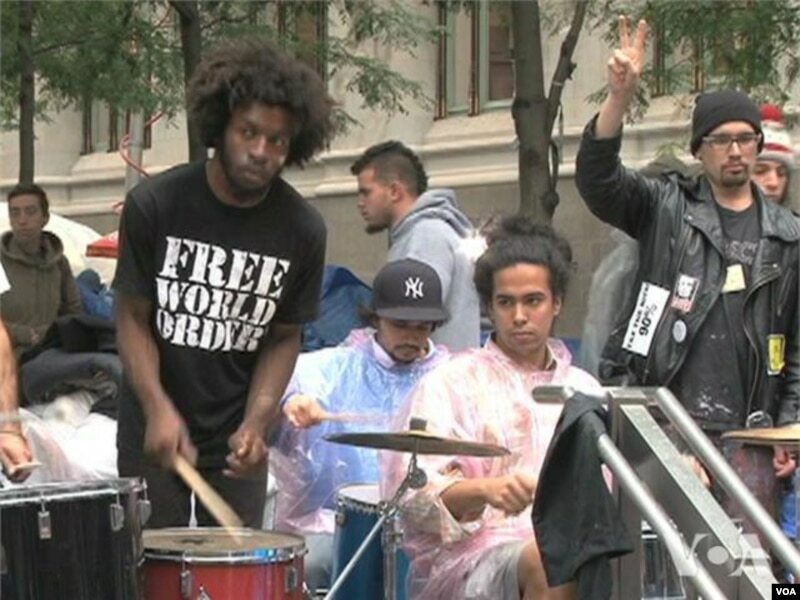 In November, police forced the activists from Zuccotti Park. The protesters expressed concerns over economic inequality, corruption and the power and influence of banks and other financial companies. The housing market had collapsed, people were losing their homes and many Americans felt Wall Street was to blame. But, it seemed that no one was being held responsible. The Occupy Wall Street movement spread from New York to other American cities and overseas. But, the movement never became the revolution activists had hoped for. Occupy activists have not seen their major goals met. These include stronger laws on banking and the environment; limits on the influence of big business on politics; and help for people late on housing payments. However, sociologist Todd Gitlin of Columbia University says Occupy Wall Street has been influential. Within months, police nationwide moved Occupy protesters out of public areas. Today, the movement’s daily presence is a few volunteers in city parks and sidewalks. They attempt to publicize the Occupy message and increase support. Justin Stone-Diaz has been with Occupy since its first day. He says small changes are important. The activist says Occupy protesters now spread their messages electronically. When needed, larger groups gather as they did at the recent presidential nominating conventions in the United States. Sociologist Todd Gitlin says studies show that Americans support Occupy causes more than the movement itself. Today, Zuccotti Park is just a place where office workers eat their mid-day meals and people might sit a while. Whether the protesters made enough noise there last year to cause the change they want remains to be seen. Justin Stone-Diaz is hopeful. He says Occupy continues to push for direct action through discussion. JUNE SIMMS: The National Museum of Women in the Arts has been celebrating its twenty-fifth year during twenty-twelve. It is closing the celebration with an exhibit honoring women in rock and roll music. Now, Christopher Cruise and I take you to the “Women Who Rock” show and play some of the music from the artists represented in the show. CHRISTOPHER CRUISE: Joan Jett’s “I Love Rock and Roll” could be the theme song of “Women Who Rock: Vision, Passion, Power.” The show explores more than seventy women musicians from early last century to now. More than two hundred fifty objects are included in the exhibit. They include a Lady Gaga costume made entirely of meat, and a guitar used by the coalminer’s daughter, Loretta Lynn. “Women Who Rock” opens with a display on Maybelle Carter and Mahalia Jackson. Carter was called “Mother” and was a founding member of the Carter Family, a country music group from Virginia. It was formed in the late nineteen twenties. Maybelle Carter played guitar, banjo and autoharp. JUNE SIMMS: The Women Who Rock show is heavy with rock star clothing. Barbara from Washington, DC, says that part of the show especially interested her. And, what about rock and roll? Cher was part Native American. The costume is based on Native American dress. It includes a huge headdress with feathers. Other costumes include punkish jeans and a tee-shirt from Sonic Youth’s Kim Gordon. There is also a very nineteen-sixties looking dress from Mary Wilson of the Supremes. The dress is made of yellow and green teardrop shaped plastic pieces. But it was famous footwear that drew two young women to the show. Twenty-six year old Tatiana from Germany had one last day of her vacation in the United States. She saw a poster for “Women Who Rock” featuring Patti Smith. So, Tatiana’s cousin Jenny decided to bring her to the show. Jenny said she could not pick a favorite performer at the show. JUNE SIMMS: The National Museum of Women in the Arts will close “Women Who Rock: Vision, Power, Passion” in early January. The show then travels to another city. JUNE SIMMS: I’m June Simms. This program was written and produced by Caty Weaver. Peter Fedynsky provided additional reporting. What Is the Future of the Circus in America? For Love's Sake...Hang Up the Phone!